Slow websites are the worst. At least that is what Google and your site’s visitors think. Google uses your website’s page load speed as one of the factors to determine where your site ranks on its search results page. Your slow site drives visitors away and reduces productivity. Users are less likely to use your site in the future when forced to wait so long for your site to load. Have you ever been frustrated while waiting for a site to load that you have clicked off of it and gone elsewhere? That’s what your site visitors are doing when waiting for your slow site to load. All websites need some tweaks every now an then, and Site Speed Optimization provides exactly that. You may be asking: what is considered a fast site or slow site? 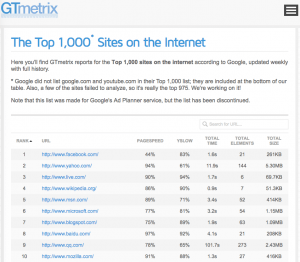 GTMetrix is a speed testing site which compiles a list of 1000 websites and their speed every day. Take a look at the above link and compare it to your site. If your website takes 10 or more seconds to load, then your site is considered extremely slow. 3-5 seconds means you’re at an acceptable but average rate. If it loads in 2 seconds or less, then you’re in the fast loading range. Find a tool that you like and stick with it this way you always have consistent results to compare against. All of the above a good and provide robust and accurate tools for finding bottlenecks on your site, so do not stress above which to use. Just pick the one you like the most and always use that one going forward. Keep in mind that your site’s speed can vary depending on the current amount of network traffic and how many visitors are actively viewing your website. 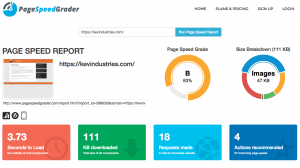 We recommend you run 5 to 10 scans of the same site to get an accurate average speed. 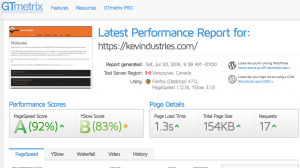 After about 10 scans you will see a clear picture of how your site is really performing. Most web browsers have tools built in that not only show you how fast your site is running, but also provide details showing why it is taking so long to load. 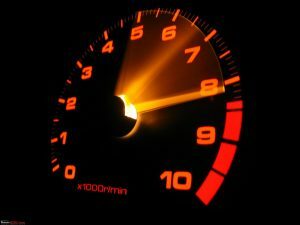 This is very useful information to diagnose and improve your site speed. Right click anywhere on the webpage and select “Inspect Element”. This opens up your browser’s developer tools. The biggest contributors to slowness are very large, poorly-optimized images. Sites that have mostly images are great looking and provide a nice viewing experience, however, they can bring any site to a halt when not formatted correctly. To avoid this, optimize all your images by making them as small as possible. Meaning both the size on disk (how much space it takes up on a hard drive in kilobytes or megabytes) as well as the actual dimensions of the image (width x height in pixels). Images should be resized before they are uploaded to the server. 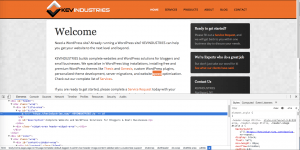 This will remove entire seconds off the total load time of the site. When your page has to download more than 3MB or it has to make several hundred requests, your visitors run into problems based off the sheer amount of data their internet connection has to process in order to load the site. To move towards a faster load time, get the number of requests and the actual size of the page as low as possible. Image optimization will make a huge difference to reduce the size of the page, and minimizing page redirects will reduce the number of requests greatly. The amount of dynamic content on a page also impacts the size and speed, so reduce this as much as possible. If you are diligent and go step by step, your site’s speed will improve and your site visitors will be happier leading to better user retention and improved SEO rankings. If you have any questions, please take advantage of our Site Speed Optimization services and we’ll get your site up to speed in no time. Good luck and happy optimizing! If you are ready to get us to optimize your site’s speed for you, please fill out a Service Request and check “Website Speed Optimization” (and any additional services) and we will reply within one business day. Thanks for reading! Please fill out a Service Request, and we will get back to you within one business day to discuss your needs. Read what our clients said.